Ann Arbor Public School PTOs could see a sizable donation thanks to its support of a study by the University of Michigan Transportation Research Institute (UMTRI). UMTRI, in a contract with the US Department of Transportation, is organizing a 3,000-participant study of vehicle-to-vehicle (V2V) crash prevention technology that is set to begin collecting data in Ann Arbor next month. Being in the Safety Pilot Program study isn’t too complicated: participants will allow UMTRI to outfit their cars with two small V2V devices for a year. Participants receive $200 at the end of the study, which they have the option of donating to an Ann Arbor Public Schools PTO. “This is a win-win situation for the community,” said Dr. Jim Sayer, an associate research scientist for UMTRI. USDOT predicts that vehicle-to-vehicle communication could reduce up to 80 percent of crashes by unimpaired drivers, according to a video on UMTRI’s Safety Pilot Program website. Vehicle crashes are the leading cause of death for people under the age of 35, taking nearly 34,000 lives each year. 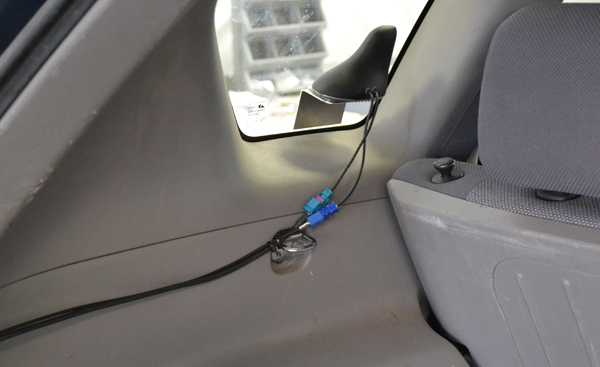 A transponder is installed under the seat in a participant’s car. No wires would be visible after installation is complete. Transponders can also be installed underneath the lining of a trunk. Dr. Sayer, who has done work on collision warning systems for 16 years, says the devices being tested in the study are more affordable and likely to be more effective than previous technologies at preventing crashes. V2V crash warning technology works this way: cars’ devices send signals out and receive signals from other cars, using that data to warn drivers of impending dangers such as the threat of a crash or poor road conditions. Most of the vehicles in the study will be equipped with a transponder, a small and thin box that emits a wireless signal and uses GPS data that it gets from a separate antenna. Roughly 400 of the vehicles will also be outfitted with another device that receives signals and warns drivers of impending collision. Sixty-four participants will drive new vehicles supplied by manufacturers with crash prevention systems integrated into them. “Different manufacturers are approaching what we call the ‘driver vehicle interface’ differently,” said Dr. Sayer. “It has to do with what their studies suggest is the best approach and what their customers want. A Cadillac customer might prefer a different system than an Audi customer.” Those in-car warnings could vary from a simple auditory signal or even a seat vibration. 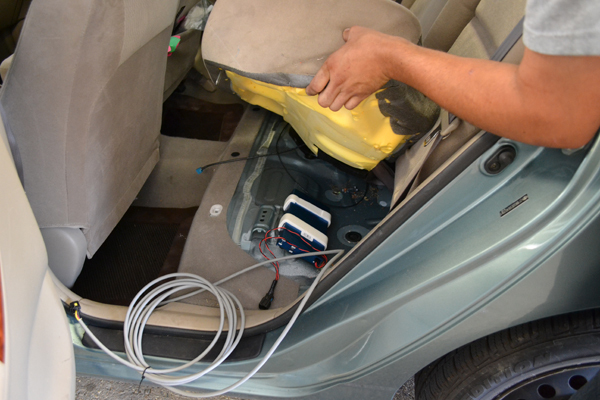 A GPS device is installed in the rear of a vehicle. The goal of the study is to gauge the V2V devices’ effectiveness during real-world driving situations. Heavy rain, snow, thick tree coverage or curvy roads could reduce the devices’ effectiveness. Ann Arbor has many kinds of roads, ranging from highways to boulevards to neighborhood streets, hilly and curvy roads that change in superelevation (the tilting of the roadway), and some roads with heavy tree canopy. This makes the city an ideal location for testing, explained Dr. Sayer. 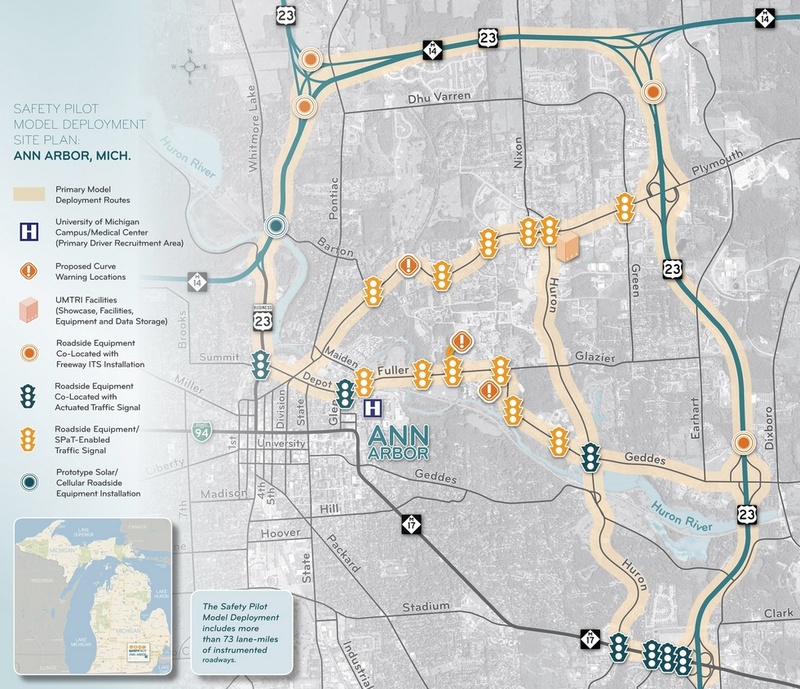 According to the map below, UMTRI’s ideal study participants live and/or work in the northeast side of Ann Arbor. Individuals who might only drive on M-14 or US-23 on that side of town are also welcome to participate in the study. This area will be outfitted with stationary devices near roadways that collect data on the signals emitted by the devices on the cars. This study could possibly pave the way for “some fairly significant economic development in the community,” Dr. Sayer said. Local companies and organizations such as Metro Delivery, Arbor Springs Water, Conway Freight, Sysco Foods, and U-M are participating for free. Anyone looking for more information about participating in the study should go to the Safety Pilot Program website.